If you’re like Team Xakia, you left the Corporate Legal Operations Consortium’s 2018 Institute with a head full of ideas. Now that you’ve returned, rested and rehydrated – and jumped back into the emails and projects that grew in your absence – how do you put your ideas into practice? If you missed CLOC this year, no worries: We have links to content below. According to the Harvard Business Review, there’s a 60 to 70 percent failure rate for organizational change projects; it will take a strategic approach to ensure what you learned in Vegas doesn’t stay in Vegas. Acumen: When it comes to knowledge management programs, 54.8% described themselves as beginners, and only 9.5% said they were advanced. Review your notes and course materials, and flag the concepts that are most applicable to your department, your company and your industry. What works in a tech company’s 75-person legal department may not be suitable for a five-person team at a university. What is truly feasible for given your business realities – your budget, your staff, your systems, your workload? You may have a dozen ideas for improving your legal operations, but it’s imperative to realistically assess what’s possible. Making one or two changes purposefully is better than 10 ideas that never get off the ground. Budget, time and technology are important factors, but don’t forget to take into account your colleagues; adopting a new idea could require them to change longstanding habits and processes. In 2016, Forbes reported a study that found leaders overestimate how much employees want to change. When asked whether they agreed with the statement “People generally want to reach for something bigger and better,” 63 percent of executives agreed; only 55 percent of frontline staff did. Set up for success by considering buy-in from the beginning. You’ve narrowed your long list of ideas to a manageable number of relevant and realistic tactics. Now it’s time to tailor them to fit your context. How does this project help our business clients? How does this project make us more efficient? How does this project improve our delivery of services? Does this project help us advance the company strategy? Talk with other legal departments who have tried your ideas; the CLOC Twitter and LinkedIn communities are a great start. Don’t hesitate to reach out to the conference speakers: They want to network, that’s why they presented. Find out what worked for them, and how they would do things differently. If you are evaluating a new product, ask the vendor if you have ideas for customizations or integrations. Most legal tech companies embrace collaboration and creativity. 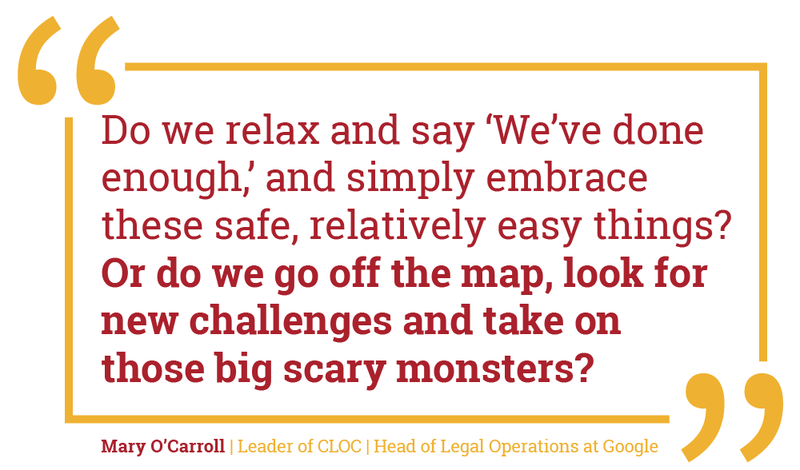 In her closing remarks at CLOC, Mary O’Carroll, the head of legal operations at Google, advised those of us in this new field to experiment and learn: “Believe me, plenty of things I work on fail. But they help us make progress! And that is the ONLY way to move forward and innovate. Do you feel the need for change, but you aren’t sure where to start? Take Xakia’s Legal Operations Health Check, and receive a custom report along with industry benchmarks for your industry and department size.